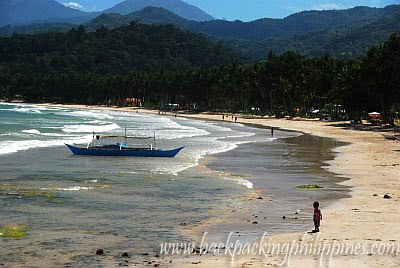 Unknown to many, Sabang is just a sitio of Puerto Princesa City and not a town in itself in Palawan. 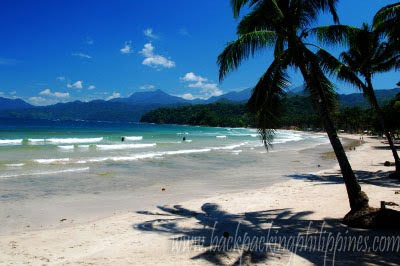 It has a nice fine white sand beach yet it's best known as the gateway to the world-famous Palawan Underground River (or the Puerto Princesa Subterraanean River National Park). Besides the Palawan Underground river, there's also the Ugong Rock spelunking and zipline, Monkey Trail/Jungle Trail, Mangrove Paddleboat Tour, the Sabang Waterfalls, and a Buddhist Temple to visit in Sabang. Donut kiosk and public toilets. There are other beach resorts on Sabang Beach offering cheap cottages that Tutubi might have missed. Please feel free to leave comments. Tutubi intends to go back to Palawan and stay in Sabang that's why he collected the information. Please call the resort's published telephone numbers for inquiries, room rates, reservations, entrance fees, day trips and other questions. As always, Tutubi is in no way connected with any of these resort establishments. Return trip from Sabang to Puerto Princesa last trip is at 2pm daily. I've seen Korina Sanchez featured Palawan on her show on AbsCBn. I was really mesmerized not only about the sights, but also the seafood. I saw the biggest and the most unique Alimango I'd ever seen. I don't know if they call it Curacha. Hi Tutubi. I've read your Curacha post. The curacha is so tempting. I hope I can get to Zamboanga too someday. i've always wanted to go to palawan! i hope to visit the place one day! All these places look wonderful. I'll have to do a little more research before I make my final selection on where to stay. I plan to visit Palawan sometime in September. Great travel guide. this is a superb place, one of Philippines finest..
tabori, yes i saw penao beach cottages, even took pictures but somehow forgot to post here. can you post contact numbers and room rates? I already had my flight tickets for palawan and planning to stay in Sabang Beach for 2 nights, does anyone have a contact number or email address of Robert's Resort? it is really appreciated if anyone could give me their contact number since i really would like to stay in this place. anyways, i would like to help anonymous and maybe you can also add this to your info above hehehe. Hi. I have been trying to book 2 nights at any good place with reasonable price at Sabang,P.P. with private toilet and bath. Is Robert's? Taraw? or Mary's Cottages good? Hi! Tutubi, thanks for this informative details for backpacker going to PPUR and I was able to use it. Anyway, I wan't to share to someone how I reach Puerto Princesa without any reservation done: From manila I planned my trip via Ship Sailing with 2GO online website (formerly Negros Navigation & WG&A Superferry) 24hrs sailing and after reach Puerto Pier I stayed in Casitas De Az Pensione, Valencia St. (route to ABS-CBN office), to make cheaper your trip going to Underground River visit first PPUR City Tourism along Rizal Ave. beside Badjao Inn to get permit clearance prior to travel in Sabang, as per suggested of my friend. Once you get your permit clearance at City Tourism, try to make reservation in Lexux VAN at San Jose Terminal (0912-1002651@Puerto) to accommodate you on the first trip and vice-versa for the return trip (0912-1002652@Sabang) to avoid inconvenience during your trip or else take a chance for other Jeep/Bus available. At Sabang present your permit at the Tourism office to book you on the boat and pay the amount of Php175/head and Php700/boat plus Php3.00/terminal fee boat are for 6 persons and if you are 2 or 3 persons you can find someone there to get share with the boat to less your fare (Php700) and I heard yesterday that they implement the Enviroment fee of Php40/head. In addition, upon reaching Sabang there's a lot of choices for accommodation you can find in Sabang if you want to stay depends on your budget as Tutubi said on his previous post. You may also check our place. PENAO BEACH RESTAURANT AND COTTAGES. For reservation, kindly contact Ms. Pia Bacosa or Roda Andrade. Below are the contact's info. Which one is better, this beach or Boracay? @ singapore... with your question as to which is better boracay or sabang beach? it depends to your preference. sabang is serene, adventure sort of, rustic but lovely and calming place to stay. boracay is more developed and been in the bussiness for a long while. hi tutubi.. can you please delete my old post that i wrote here about sabang and PENAO 2 years ago..T_T I was not in my right mind when i wrote those stuff..That post was full of errors (e.i typo graphical error, wrong grammar ). I apologize for the mistakes that i made. Kindly help me advertise our place in sabang. The name of our place is PENAO BEACH COTTAGES and RESTAURANT. We offer accommodation for as low as 800php per night Lunch Buffet for as low as Php 200php / person (inclusive of drinks, variant of pork;fish;chicken; vegetables, fruits, soup,salad). We also served breakfast and dinner. We served the best quality of seafoods in town such as shrimp, prawns, squid and fish. I also recommend that you should try our mouth watering tanigue kilawin,Penao's Pizza, Penao's sandwich and most especially our ihaw ihaw sa Penao chicken bbq for as low as Php 148php that comes with a drink and unlimited rice. Thank you so much for sharing your experiences to people like me! 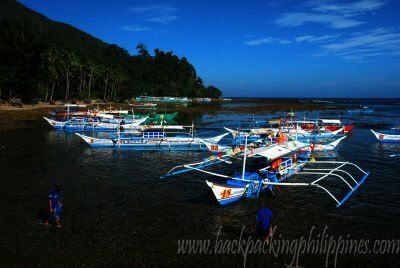 I've been to a lot of tours in Asia but there only one place I really wanted go again and again and that is Palawan. I enjoyed every second I was there. It's a perfect paradise and leisure to go through, recentless and relaxing adventure are the words I describe that location. Fantastic!